Chileans love soccer. That is probably no surprise to you as most of the world loves soccer. From my very first moments in Chile, I had kids coming up to me in the street and asking which soccer team I liked. A great Chilean souvenir that you can get for your friends, family, or yes, even yourself, is a Chilean soccer jersey. The question will be: which Chilean soccer jersey should you get? Most stores and vendors have jerseys from the big three soccer teams in Chile: Colo Colo, la Universidad de Chile, and la Universidad Catolica. 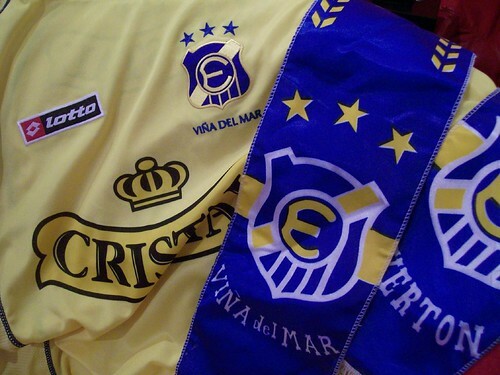 Although these are the most popular teams in Chile, there are seemingly countless other teams as well. You’ll find their respective jerseys for sale as you look but keep in mind that they aren’t always as easy to find. Most Chilean soccer jerseys have a very large and prominent logo or name of the sponsor on the front. Many jerseys have Cristal emblazoned on the front. This is the unofficial national beer of Chile. You’ll see this logo (and associated beverage) everywhere you go. If a store sells soccer jerseys, it will also likely have ones from the Chilean national team, affectionately known as La Roja or “The Red.” These uniforms seem to change every year so you might be able to get a training jersey or last year’s version cheaper than the current, official shirt. Good luck in your soccer jersey hunt. If you buy a Chilean national jersey, be sure you practice yelling your Chilean cheer: CHI CHI CHI LE LE LE, Viva Chile!